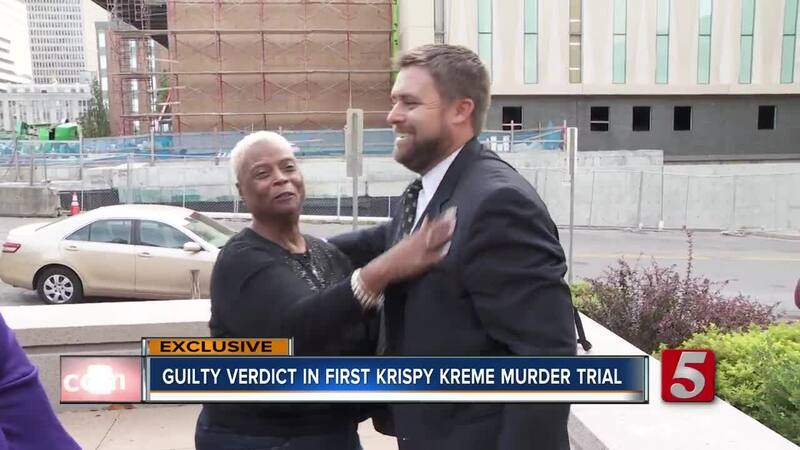 One of two men accused of killing a Krispy Kreme delivery driver has been found guilty of first degree murder. In addition to first degree murder, a jury also found Daquan Fields guilty on Thursday of aggravated robbery and reckless homicide. Fields could be facing life in prison. His sentencing has been set for 1 p.m. on November 14. Savion Wilson, also charged in the killing of Al Baker, has not yet had his trial, a court appearance has been scheduled to begin September 20. In 2016, Baker was making a delivery to a Mapco on Donelson Pike when officials with the Metro Nashville Police Department said he was shot by Fields. According to investigators, Fields and his getaway driver – identified as Wilson – went to the convenience store to rob it. In the process, Fields allegedly shot Baker for no apparent reason. They were both arrested months later. Baker's wife, Faye, said he worked for Krispy Kreme for nearly 32 years and loved his job. "They don't realize what a wonderful man they killed," said Faye Baker. "They don't know anything about him or what he was about." Wilson is also facing charges of first degree murder and aggravated robbery when he goes to trial in September.